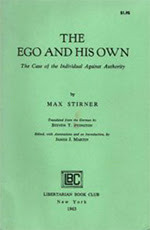 Another find by Martin Wagner: A RAW review of The Ego an His Own by Max Stirner, an edition put out by the Libertarian Book Club. "This is probably the most disturbing, shocking and generally infuriating book in the whole history of political philosophy," Wilson writes. From the pages of Jaguar, apparently a vintage men's magazine.